I gave up. SEO doesn’t work, I said to myself. SEO isn’t for bloggers like me, it’s for the big businesses with millions to spend. I’ll never compete. So I ignored it, and focused on other tactics to grow my business and generate traffic. However, one day I noticed a spike in sign ups to my email list. I wasn’t running any advertising. Instagram, Twitter and Facebook were all ticking along as normal and I hadn’t been trying any new strategies. I couldn’t work out where these people were coming from. Out of the blue, I got a couple of affiliate payments through on Paypal for a training course I’d promoted about 18 months ago. And then a few days later I got another affiliate payment through. Well, it turned out Google was my new best friend. Because an old, long forgotten blog post that contained an affiliate promotion was suddenly ranking #3 on a really competitive search term on Google. I checked my stats. I was getting thousands of visitors, all to this one page. And the icing on the cake? I was making a nice little side earning with affiliate commissions, without really doing anything. What I learned is that when you do SEO, you’re playing the long game. Yes, the results aren’t as immediate as something like Instagram, but like I always say – and if you’ve taken any of my Instagram sales funnel training, you’ll know this – is that you should always master more than one traffic source. Never put all your faith in one platform, because things can and do change. So although I heavily promote my business on Instagram, I also market it in other ways too, and one of my long term strategies is to invest some time in SEO so that I can get a steady stream of free traffic from Google. Because trust me, all you need is one or two pages to get a good ranking to suddenly start getting thousands of visitors. So if you’re a bit like me, and hate SEO, but you want that long term traffic insurance that only something like SEO can give you, what’s the best way to go about it? Well, here are my top tips. If you have the budget, SEO is a good thing to outsource, because there are people who do this for a living and know SEO inside out. However, there are a lot of people who “claim” to do this but don’t have the results to back it up. In that case, it can get expensive fast. So do your research first before hiring. Look for client testimonials, and look at how recently results were achieved – SEO testimonials from 2008 are no good nowadays. If you already have a blog, then invest some time doing some basic keyword research and optimise your existing posts. It’s not much when it comes to SEO, but it’s better than nothing, If you use WordPress, I’d highly recommend a plugin called Yoast for SEO optimisation. It’s the best in the field as far as I’m concerned (and more importantly, real SEO experts will recommend the same). This is just from my own experience. When you have a blog that’s been around for a while, you can start looking in depth at your traffic stats, and what they’ll often tell you is this. You’ll have a large percentage of blog posts that don’t do great, and a small percentage that get a lot of organic search traffic. So my suggestion? Keep writing plenty of quality, relevant content. That’s what Google loves, and if you stick to this, eventually one or two of those posts are going to do well in the search engines, and you’ll start to reap the rewards of all your hard work. Well, admittedly, SEO is a dry subject. Especially if, like me, you prefer something more friendly and beautiful like Instagram. So I tend to just follow a couple of SEO experts who help me stay updated and put things in a simple language that I can understand. One of those experts I loyally follow is blogger called Lena Gott, author of WhatMommyDoes, who has grown her own blog to over 400,000 monthly page views in the space of just 10 months – a staggering achievement for any blogger. I love Lena’s story, because like so many of us blogging she got frustrated with watching her page stats every day and not seeing that nice upward trend we all want, so Lena was smart enough to embark on a tonne of experimentation to discover what she needed to do to get those page views up. And that’s what she’s done. Through a lot of trial and error, she has created a very straightforward 21 step method for growing your blog traffic. Lena shares her 21 step strategy in an eBook which you can get here. Her eBook cost me less than $80 when I purchased it and I can hand-on-heart say I have learned so much more in her small eBook than some very expensive premium online courses I’ve taken over the years. In the eBook, Lena will show you real stats and real case studies from her own blog and explain in very simple (and non-technical) terms about what you need to do to get the same result. In Summary: Ignore SEO at your peril! So there’s your word of warning. It’s tempting to think SEO is just too big a mountain to climb, but I’d urge you not to ignore it, even if you’re getting great results on Pinterest, Facebook, Instagram or other traffic sources. Because you never know if one of those big companies is going to change a policy or an algorithm and wham – you’re traffic disappears overnight. So it pays to diversify! And search engines aren’t going anywhere. At the very least, get some basic training under your belt so you can tackle it with a bit more confidence. You don’t have to be a master SEO guru; just don’t ignore it and hope for the best. 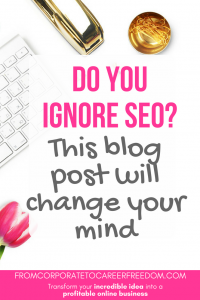 SEO seems to be every blogger’s nemesis, doesn’t it? If you do the bare minimum for the phrases that people actually search for, you should do fine. SaraBeth recently posted…Why Do I Need a Blog Content Refresh? I can relate to this post. When I was starting out, my patience ran out because of SEO. I always procrastinate in learning how to do it wisely. Until there is light that shines through this effort. Now I realize and I also tell this to my client, that you can see a result in 6-12 months time. This is a slow process but with a very rewarding result. Thanks for sharing your experience. Good luck in all you do. I subscribed to your site and shared this on my Twitter. We do on the contrary: SEO is in house, writing and other stuff partly is outsourced. Is it okay? I’m a link builder and I agree when you said that SEO is for the long term game and its not for those bloggers without patience. SEO is very broad but there are simple strategies like link building that when done correctly, will make a huge impact. Cheers! I know the feeling! Keep at it. It’s so disheartening when you don’t see an immediate payoff but the day when you check your traffic numbers and start seeing that jump in Google referrals it feels so great! Sometimes it just feels good to put two heads together and brainstorm. Working with an outside SEO consultant gives you a sounding board for your ideas and validates your SEO strategy.